The best way to get a sense of Dallas County may be to drive between its northwest and southeast corners. In the northwest, you drive through the office parks, golf courses and tightly-packed mansions of Valley Ranch. In the southeast, you will find small Paul Quinn College, a Historically Black institution that has brought itself back from the brink and converted its old football field into an organic farm. Those two areas and the 25 miles between them tell the story of a Big City county that must balance the wants and needs of an immensely complicated set of communities. The physical landscape makes plain the divides; Trinity River and Interstate 30 mark the demarcation between the northern and southern sectors of the city. The city center is carved up by highway with green space interspersed. 55% of residents live north of the River while 45% live south. The median home value in the zip code 75230 in North Dallas is $497,400. In contrast, in Paul Quinn College’s zip code 75241, the median home value is $75,800. Yet southern Dallas, encompassing 185 square miles, contains about 54 percent of the city’s area. (All of Atlanta would fit within it.) It exists in the same county as North Dallas, but feels a world away. Dallas County (pop. 2,574,984) has many characteristics of a vast urban center: diversity — 40% Hispanic, 29% white, 23% African American, 6.5% Asian, 1% Native American, 23% foreign born and plenty of out-of-state transplants — as well as the strains of economic inequality and segregation. In its diversity characteristics, Dallas County fares better than other Big Cities, according to the 2018 County Health Rankings. Dallas County’s residential segregation score between blacks and whites, at 49, is lower than the 53 median for Big Cities. The same is true of the residential segregation between nonwhites and whites, where Dallas County comes in at 37; the Big Cities median is 42. Income inequality, defined as ratio of household income at the 80th percentile to income at the 20th percentile, stands at 4.7, a couple of notches below the Big Cities median of 4.9. Other numbers underscore Dallas County’s ongoing difficulties in residents’ access to care and overall health: The uninsured rates for adults and children are 27% and 11%, respectively. In Big Cities, the median rate of adults uninsured is 14%; for children, it’s down to 4%. In Dallas County, the ratio of the population to primary care physicians is 1,450:1; for Big Cities, the ratio stands at 1,150:1. A similar situation exists in the ratio of the population to mental health providers. In Dallas County, it’s 780:1; in Big Cities, the median is 337:1. When it comes to overall health in Dallas County, 19% report being in poor or fair health; for Big Cities, 17% say so. The city of Dallas is fulfilling a strategy to promote sustainable growth in its southern sector. 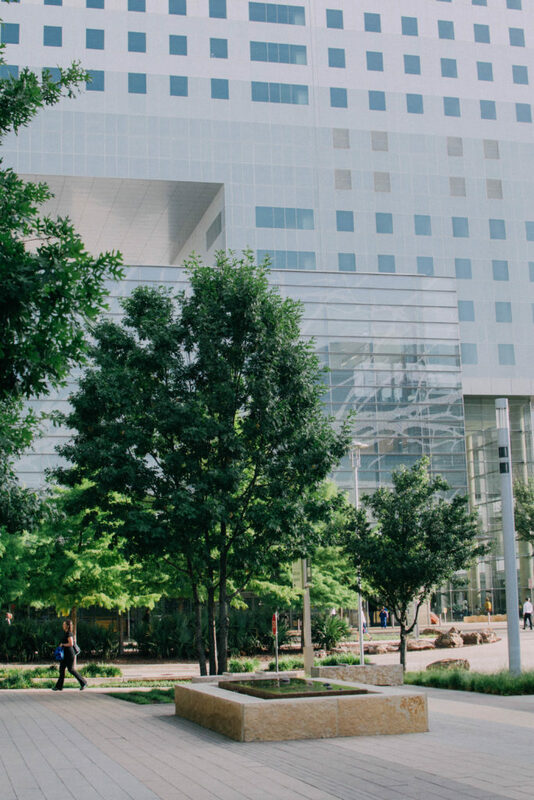 Parkland Hospital focuses on the social and economic factors shaping health. Collaborations with area nonprofits help to coordinate care. The Dallas Office of Welcoming Communities and Immigrant Affairs was established in March 2017 with an eye toward equity and connected communities. Philanthropic work is helping to improve and integrate mental healthcare services more seamlessly into the community. “I want you to remake America and get it right,” Paul Quinn College President Michael Sorrell commanded some 60 incoming freshmen in class on a 100-degree, July day. The historically black college in southern Dallas was founded in 1872 by African Methodist Episcopal Church preachers to provide an education to newly free African Americans. Sorrell assigned his students to create a new economic model to replace slavery in 1860 just before the Civil War. He implored them to not merely focus on freeing slaves but explain how they would build a blended community — and lead everyone. Sorrell works with such a mindset. When he took over Paul Quinn in 2007, it was edging toward closure; just 151 students were enrolled. Since then, he’s positioned the institution to move the needle on the most intractable problems in the Highland Hills neighborhood of South Dallas and society at large. Paul Quinn adopted the work college model — the first urban college to do so — requiring all students who live on campus to work for the school. This has reduced student tuition and fees and enables students to graduate with less than $10,000 of student-loan debt. 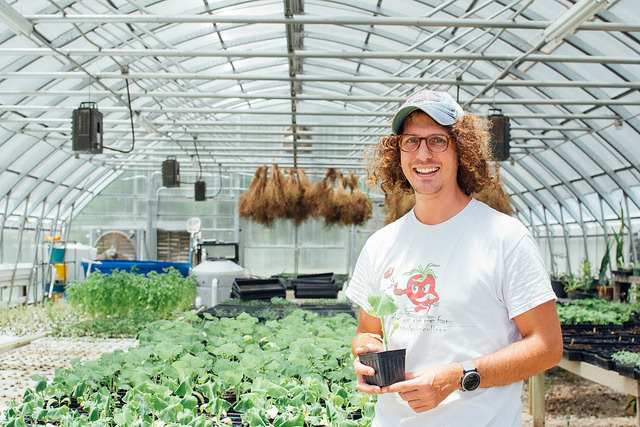 Through a partnership with PepsiCo, in 2010, he turned the school’s football field into the “We Over Me” farm that employs students and grows a myriad of organic produce. The sustained effort is slowly opening an oasis in a recognized food desert. In 2016, after years of stakeholders’ persistence, a grocery store, Save-a-Lot, opened across from the school. 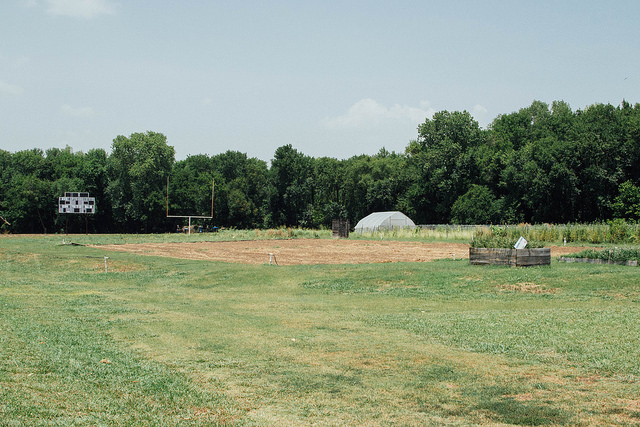 The “We Over Me” farm still features the goal posts and scoreboard from its days as the school’s football field. Paul Quinn, too, has blossomed during Sorrell’s tenure. Today, the school enrolls 550 students, and in July, Sorrell announced plans to open a second campus in Plano, Texas, a wealthy suburb just north of Dallas County, in the 2018-2019 academic year. 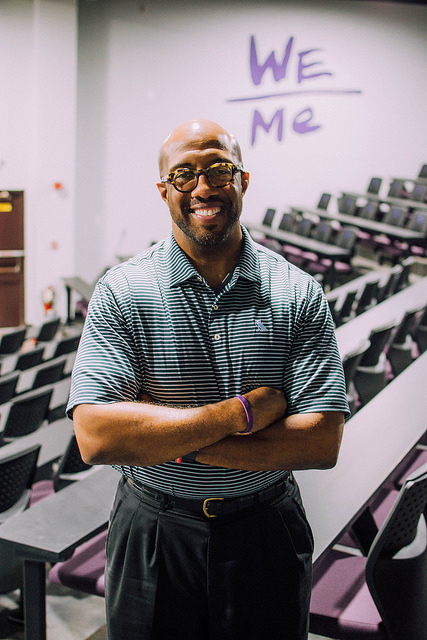 Listen to Michael Sorrell, president of Paul Quinn College, a Historically Black College in southern Dallas, describe a way to attack poverty, drawing on his parents’ backgrounds and his upbringing. GrowSouth is a strategy to promote sustainable growth in southern Dallas. Toward this end, Dallas City Council in June approved $22 million to redevelop Red Bird Mall (known today as Southwest Center Mall) — at the intersection of two major highways, Highway 67 and Interstate 20 — a cultural and commercial landmark that opened in 1975 but is now nearly empty. Investor Peter Brodsky, who purchased the mall in 2015, is poised to realize a vision of bringing high-quality amenities to the underserved population of southern Dallas County. Plans for the 78-acre project include restaurants, a movie theater, a hotel, green space, office space, a 25,000-square-foot workforce development center and a special Starbucks with space for meetings and job training for 100 people a year. Brodsky’s team also seeks to turn part of the mall into a medical hub with 50,000 to 70,000 square feet in outpatient clinics, he says. While there are concerns about gentrification, he notes that leaders for Red Bird are being drawn from a talent pool of nearby residents who understand the community’s needs and what resonates. Brodsky has faced skepticism about his intentions and his ability to make good on his promises, he says. However, friends have vouched for him, and he’s never turned down meeting with stakeholders, including homeowners’ associations, churches, mall walker groups and realtors. He’s opened community meetings with candor: “I want to acknowledge that the sight of a North Dallas businessman announcing they’ve bought an asset that you’re proud of fills you with dread and makes you wonder, not if you’re going to get screwed, but how you’re going to get screwed, and then, I acknowledge the history,” he says. In these forums, he’s listened intently — with promising response. Putting in an incubator space, designed for entrepreneurs and mentorship, came from community members; the Dallas Entrepreneur Center will open this fall. Brodsky’s team plans to break ground on the $157 million project in early 2019. Could it become a model for other cities? Brodsky hopes so. Dallas is pushing to create a more inclusive culture in other ways. The Dallas Office of Welcoming Communities and Immigrant Affairs, established in March 2017, acts as a convener on the “Welcoming America” framework, the pillars of which include equity; and safe, healthy and connected communities. A task force of 85 residents formed, encompassing leaders of immigrant-serving organizations, three medical doctors, a psychologist, social workers and public health workers. The group is focused on how to continue becoming a welcoming community. Fear is considered one of the greatest barriers immigrants face in Dallas, says Director Mary Elizabeth Cedillo-Pereira. One way the group addresses it is by examining how children are being impacted by the policies of separation and deportation as well as fears of bullying. The office has kicked off a citizenship campaign based on research that about 46,000 residents qualify for citizenship but haven’t applied, says Cedillo-Pereira. The reasons: fears of taking the test, language barriers and lack of education literacy. On the language front, the city council recently increased funding for an ESL program. A longtime resident of Dallas, Cedillo-Pereira says she’s noticed a renaissance in the immigrant community and more emphasis on inclusive diversity. Next generation leaders are emerging, while the city’s various ethnic groups — Latinos, African Americans and Native Americans — are coming together to preserve their groups’ histories. Parkland Memorial Hospital is Dallas County’s public hospital. In the meantime, the effects of segregation continue to manifest in community healthcare. The uninsured rate in the county stands at 23%; in Dallas, it climbs to 28%. The south-central part of Dallas is a medical desert. The public hospital, Parkland Memorial Hospital part of Parkland Hospital & Health System, acts as the county’s primary safety net; the uninsured rate here reaches 45%. The Dallas County Community Health Needs Assessment recently highlighted strengths of the public health system, including national experts, strong intervention infrastructure and maternal and child health resources. In November 2008, 82% of Dallas County residents voted for a bond measure to build a new, 1.9 million-square-foot facility for Parkland that most will never personally use. One-third of the $1.8 billion hospital budget is supported by county tax revenue. “It’s a pretty conservative state, but Dallas County supports its public hospital. There’s a lot of pride in Parkland,” says Dr. Frederick Cerise, CEO of Parkland. Residents cite a desire for the best public services available, a charitable spirit, the hospital’s longevity — it was founded in 1894 — and its historical significance. After President John Kennedy was shot while riding in a motorcade through Dealey Plaza in downtown Dallas, he was brought to Parkland where doctors tried to save his life. Nearby, the Sixth Floor Dealey Plaza Museum commemorates Kennedy’s life, death, and legacy — located in the same spot where Lee Harvey Oswald shot and killed the president in November 1963. Lately, Parkland has been tackling the social determinants of health to a greater degree. It’s a mindset shift for the hospital, Dr. Cerise says. Collaborations among nearly 100 community nonprofits, including the North Texas Food Bank, large shelters and faith-based institutions, share information about patients to better coordinate care. Cerise is a member of a task force on homelessness. As of spring 2018, the number of unsheltered homeless in Dallas County tallied 1,225, according the Metro Dallas Homeless Alliance. The three-year-old, state-of-the-art facility notwithstanding, Parkland faces challenges of its own. The state’s decision to not expand Medicaid curtails access to care and makes planning to meet patient demand more unpredictable, Cerise says. The demand for services remains high, whether it’s trauma, chronic disease, substance abuse or behavioral and mental health illnesses, says Cerise. The hospital looked to industry to improve its processes in the new facility. Experts from Toyota, a new employer in the Dallas metro area, came to Parkland to analyze patient flow in the emergency department and helped reduce discharge times. In the same vein, Parkland is working to deliver care differently. An infectious disease doctor has been teaching patients to give themselves intravenous antibiotics, which has saved the hospital $40 million in five years, Cerise estimates. Moreover, an analysis found that email consultations can cover 60% of new referrals, and these are being used more frequently, particularly in dermatology cases. The method also helps patients who can’t come to the hospital. Commerce and healthcare coalesce often in Dallas County — and the seeds of change are rooted here. 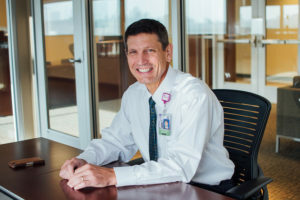 In an office abutting a golf course in Irving, northwest of the city, President/CEO of Dallas-Ft. Worth Hospital Council (DFWHC) Stephen Love looks to link the two areas in his advocacy of hospitals. In 2017, DFWHC released an economic impact study showing that healthcare is the second largest sector in North Texas, accounting for $18.4 billion in labor income. Achieving cost efficiency in care and educating people to be healthier are key priorities for the Council. For example, DFWHC and its Foundation are pushing for North Texas to become smoke-free, one city at a time, in order to boost health, save costs and increase workplace productivity. 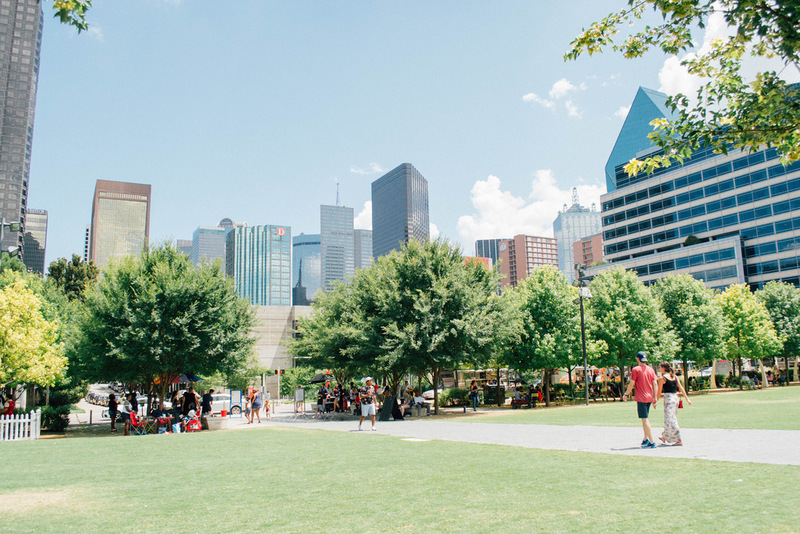 The city of Dallas prohibited smoking in restaurants in 2008, and has been expanding its scope, most recently to public parks in March. On smoking rates, Texas is among the top U.S. performers with a rate of 14%, according to the 2018 County Health Rankings. Dallas County’s rate stands at 15%. Philanthropy, too, is driving healthcare progress here. According to The Chronicle of Philanthropy, Dallas is the eighth most charitable city in America. The two dovetail in the area of behavioral and mental health, a top priority for Dallas, according to the county assessment. The Meadows Foundation has raised the visibility of mental illness through partnerships with state and local governments, grantees and philanthropic colleagues. An outgrowth of the foundation, The Meadows Mental Health Policy Institute (texasstateofmind.org), based in Dallas, Austin and Houston, provides policy research and development to improve mental health services in Texas. 100% detection and treatment of psychosis. The institute has moved steadily forward. One five-year initiative, the Dallas County Caruth Smart Justice Project, aims for Dallas to cut in half the population in jail for no other reason than mental illness. Another with promising results seeks to expand integrated mental healthcare within children’s primary care. Children’s Health in Dallas initiated this program to help to diagnose and treat mental illness, reaching more than 80,000 children on Medicaid. Now the institute is partnering with Children’s Health, Texas Children’s Hospital and Texas medical schools to bring the program statewide with support from foundations and the state senate leaders who have prioritized mental health. Texas has made notable advances in this area. In 2016-2017, the legislature on a bipartisan basis passed 13 bills designed to improve mental healthcare. One bill created a $37.5 million grant program to reduce arrest, incarceration and recidivism among people with mental illness. Another provides payment for adolescent mental health screenings. Biennium spending for mental and behavioral health has increased from under $7 billion to more than $8 billion, underscoring that this issue is more uniting and central than ever.